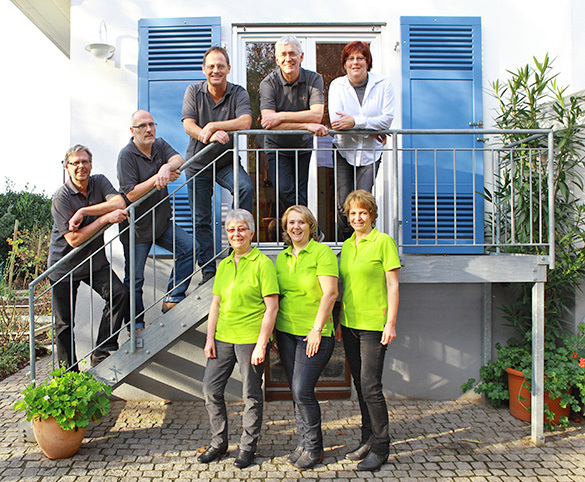 Partner – owner mhe (upstairs middle) with employees. That developing and producing customized high-tech electronics not only needs a great deal of engineering expertise and skill but also requires a lot of understanding and consideration of not only the customers’ wishes but also the staff is exemplified by Matthias Huber and his company mhe in Renchen [near Offenburg in south-western Germany]. Many of his initial customers are still in business with the company after 20 years and are letting mhe develop or produce customized electronics for them. “But I am only as good as my team. It’s what is in their heads that counts”, notes Huber, who has three university certified engineers in his staff of nine. “Every two or three years we pack up all our families and go visit one of Europe’s capitals. After you can always feel a huge boost to creativity and motivation”, the company’s owner tells us. Located in a very pleasant neighbourhood in Renchen every member of staff is free to come and go as they please at mhe’s headquarters. Huber notes: ”it is possible that someone will only show up at noon but still be there at night. The staff need to enjoy their work, that is the only way for ideas to come and solutions to be found.” And thus mhe’s 20th anniversary is celebrated in a festive atmosphere. Power-operated gates can be safety hazards. However, there is still too little attention payed to these dangers and a liability suit can be more than an inconvenience to architects, technicians, landlords or administrators. Generally, power-operated gates are categorized as machines. This means they are subject to Machinery Directive 98/37/EC. The manufacturer is required to perform a hazard analysis. In November 2000 a European Standard, EN 12453, was drafted and given the title “Industrial, commercial and garage doors and gates – Safety in use of power operated doors – Requirements.” In Germany it had to be implemented by May 2001 and was also published as DIN (German Industrial Standard). 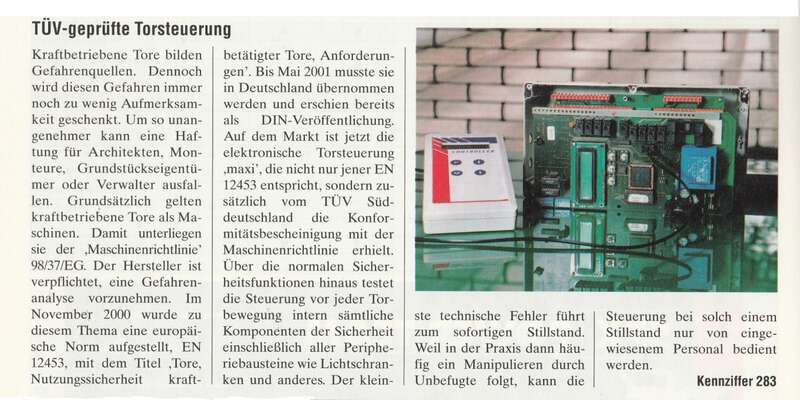 The gate control system “maxi” which is now on the market does not only fulfil the requirements of the EN 12453 but also received a certificate of conformity for the Machinery Directive by the TÜV Süd (German technical supervisory association for southern Germany). In addition to the normal security features the control system also tests every internal component for security as well as all peripheral modules such as light barriers before every movement of the gate. The slightest technical irregularity leads to an immediate shut-down. In practice this often leads to tampering and manipulation by unauthorized persons which is why in case of a shut-down the control system can only be operated by trained personnel.